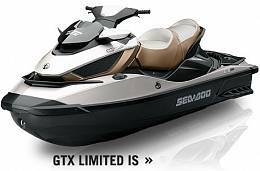 The GTX Limited iS 255, equipped with iControl, the world most advanced watercraft system, interactive gauges, a high performance Variable Trim System, 3-up riding and touring seat, will turn countless heads. Of course, with an authoritative 255 hp Rotax 4-TEC engine under the dashing exterior, this PWC will be nothing but a blur anyway. 255 hp supercharged, intercooled Rotax 4-TEC engine (CARB 3-Star certified). The world�s first full suspension for a watercraft offers more comfort and control, so you can ride longer, even in rough water. The world�s first braking system for a watercraft. Lets riders stop with enhanced control. The most advanced throttle control for a watercraft, iTC features the world�s first "neutral" making for easier dockside starts and stress-free maneuverability, even in tight areas.